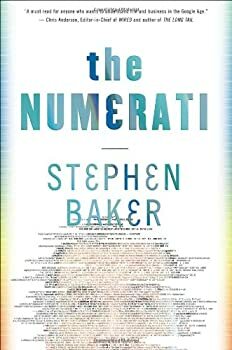 The Numerati by Stephen Baker remains a fascinating work about sensors, technology, data mining and where it’s all going when it comes to our privacy. And it ends up all about data, about collecting, refining and interpreting it. People are, well, a bunch of fish in a bowl. Or, if you prefer, hamsters on a wheel. We are lab rats, we are subjects, we are collections of bit streams. We are … information. And the kicker is that, put together enough things about us, and conclusions can suddenly be drawn. Let’s say I go to the same grocery store every week (not a stretch – I really do). And I buy fish every single week. What if I buy, say, tuna steaks 70% of the time, and swordfish the other 30%? Am I automatically a tuna lover? Or am I simply scared to try something new? Or am I getting to the fishmonger when everything else is sold out? And what happens if a coupon is introduced into the mix? Does my tuna consumption go up to 80% if you give me $1 off per pound? However, that’s not too much of a victory, seeing as I normally buy it anyway. Will a $1 off coupon entice me to buy more pricey salmon instead? The data gives its interpreters (Baker refers to them as the Numerati, which sounds a tad like Illuminati and perhaps he means that) ideas. However, it’s not really a slam-dunk. Or, at least, not yet. Hence essentially the Numerati bucket you. So I am a tuna buyer. And I am a sometime swordfish buyer. And I am also a Caucasian woman, in her (ahem) fifties, married, no children, living in Boston. So far, so good. And when the data are all herded together, when the bits and bytes of our lives are aggregated, this may very well have a lot to say about us. Because it might be a predictor of how I’ll vote in the next election. Or perhaps it will show how I’d use a dating site if I should ever need one in the future. Or it may even tell whether I’m likely to become a terrorist. The data matters, but, to my mind (and to Baker’s as well, it seems), there are not only herds of data but there are also nagging outliers. And these constitute the Border Collies amidst all the data goats. Perhaps I am buying tuna to feed to a cat. Or maybe I buy it with the intention of eating it to improve my health but, alas, never get to it and it goes to waste every single week. So consider this case: a sensor is placed into a senior citizen’s bed, to determine whether that person is getting up in the morning. And, let’s say we also collect weight data. Because a sudden dramatic rise in weight would indicate the possible onset of congestive heart failure. And let’s say the senior in question is a woman who weighs 150 pounds. Your own mother, maybe. Day one: 150 pounds. Day two: 158 pounds. And then day three: 346 pounds. Day four: 410 pounds. Golly, is Mom really that sick? Maybe Mom’s dog is 8 pounds. Okay, that explains day two. But what about days three and four? Maybe Mom’s got a boyfriend. Or maybe she’s got two. When I had the occasion to meet Stephen Baker, we had the opportunity to talk a bit about these squishy, messy feelings. Sure, our hearts are in the right place. And we want Mom to be safe and healthy, and we can’t be there. She might live in a warmer climate, and we cannot (or won’t) leave our cooler climes. Or the job opportunities may be no good there for us. For whatever reason, we are here and she is there. So we want to be aware, and caring and all, but in our desire to gather information and protect her, what else are we learning? If Mom is competent, and single, and protecting herself from STDs, we truly have no business knowing who she spends her evening hours with. Yet this technology makes this possible. And if we have any sense of the future at all, we have to think to ourselves: what happens when I become Mom’s age? Will my bedroom and toileting habits potentially become a part of this huge bit/byte hamster wheel lab rat canary in a coal mine data stream? You betcha. It is often said that only people who have something to worry about in their private lives are the ones who are worried. Everyone else should be fine, blithely giving up their warts and preferences, their virtues and secrets, to all who ask. I say bull. I like my secrets. And I like my hidden life. And I’ll be damned if I give it up, even in the name of health, diet, voting, national security or even love. A terrific read. I highly recommend this book.